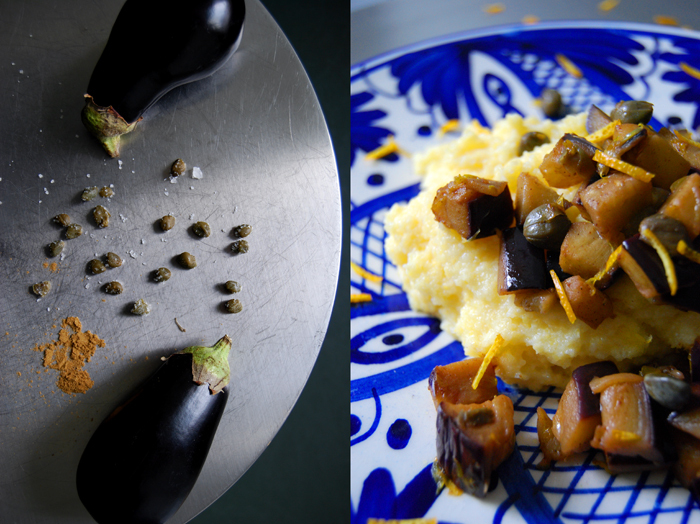 Today, all the warm colours of autumn are combined on my plate, brown cumin, golden cinnamon, green capers, purple aubergine and bright oranges! The transition from summer to the next season brings the spices back into my cooking, my big spice box is out almost every day! In June, July and August, I follow my love for fresh, woody herbs, rosemary, thyme, oregano or fleshy sage, mint or basil leaves, but now it’s time for some exotic mixtures again. 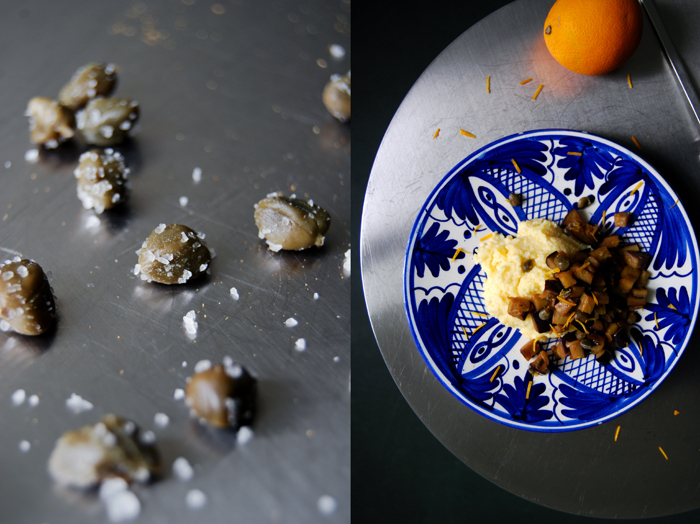 Salty and citrus flavours mixed with earthy cumin and sweet cinnamon. 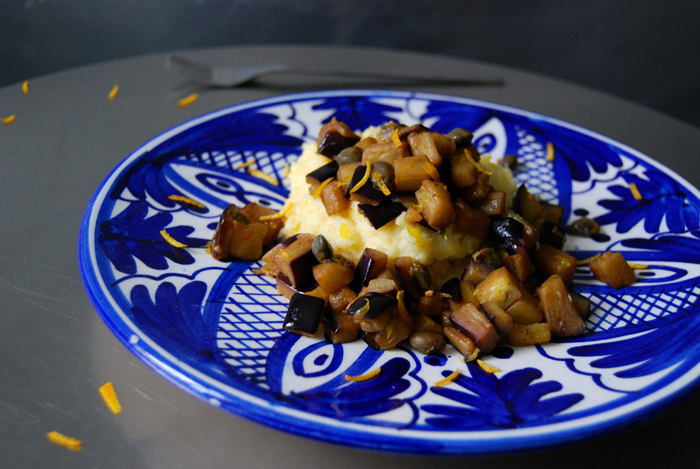 It works great, and the juicy aubergine, with its unobtrusive taste stands up surprisingly well and holds it all together. I got all excited surrounded by these deep aromas in my kitchen, so I decided to try out something new when I mixed the cornmeal into the milk for my polenta. 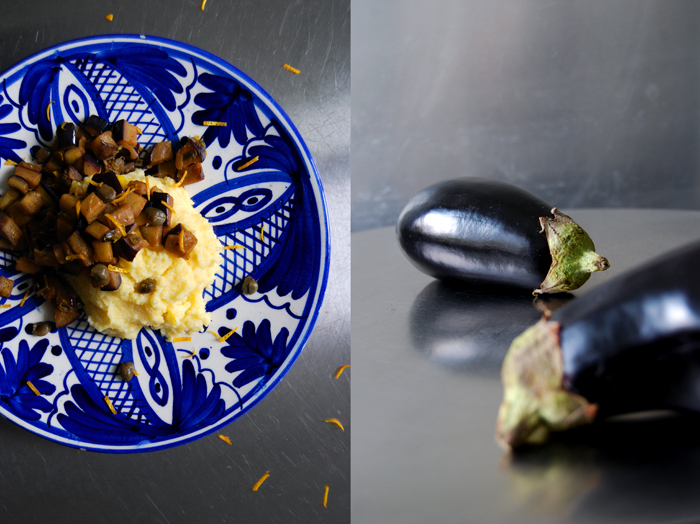 I cooked it with a few strips of orange zest, I didn’t want it to be pure and naked next to the rich composition I prepared for the aubergines. It was a wonderfully warming dish, in colour and taste, a little bit surprising in flavours, but really, really good! So good, that I already bought a couple more aubergines for the next batch! In a large pan, heat a splash of olive oil, the garlic, cumin, cinnamon and capers for 1 minute, stirring constantly. Add a little more oil and the aubergine and cook for 5 minutes on medium heat or until the aubergine is golden and soft. Deglaze with the juice and season with vinegar and salt to taste. 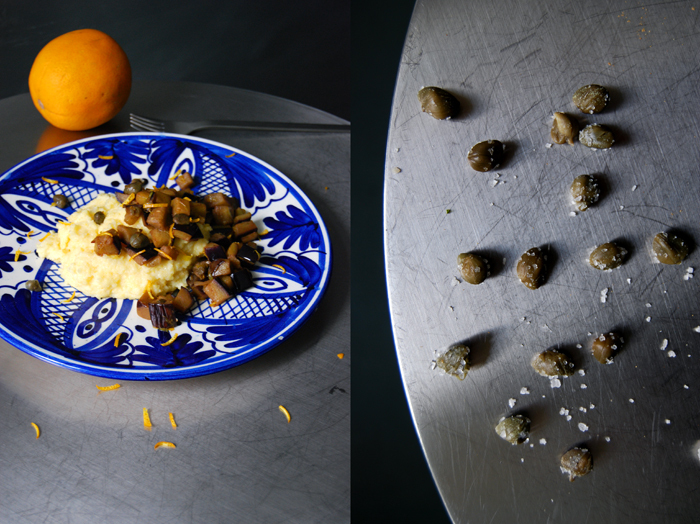 Sprinkle with orange zest and serve with the warm polenta. In a sauce pan, heat the water and milk, add the salt and bring to the boil. Take the pan off the heat, add the olive oil and polenta and whisk. Add the orange peel, turn down the heat to the lowest temperature and put the pan back on. Cook the polenta for 10 minutes mixing and adding more water once in a while.